I think it’s important to begin this review with some comments about the attribution of these recordings since I suspect that most, if not all, of them have circulated at some time before and collectors may wish to avoid duplication. The recording of Symphony No 7 is a commercial one, made for EMI. The others are all off-air and the recording of the First Piano Concerto has been issued by Music & Arts and, for all I know, by others. I’m somewhat uncertain about the recording of the Fifth Symphony. There’s a comprehensive listing of Cantelli’s concerts and commercial recordings in the biography by Laurence Lewis: Guido Cantelli. Portrait of a Maestro (1981). According to Mr Lewis’s listings Cantelli didn’t conduct the NYPSO in February 1954. But he was conducting the NBC Symphony Orchestra that month and a performance of the symphony is noted on 21 February. Music & Arts have issued a Beethoven Fifth with the NYPSO from 6 January 1952 but I don’t believe it’s the same performance as the one in this box. I’m afraid there may also be a bit of doubt surrounding the performance of the Third Piano Concerto. According to Mr Lewis again, Cantelli led three performances of the concerto in March 1955 of which the last, on 13 March, was broadcast. However, the soloist was not Rudolf Firkušný but Rudolf Serkin. Since the booklet shows little evidence of detailed research I’m more inclined to trust the published biography and in the header to this review I’ve indicated within square brackets where information from the Lewis biography has been added. Cantelli (1920-1956) was a brilliant phenomenon and who knows what he might have achieved but for his tragically early death in a plane crash, just a week after being named Music Director of La Scala. In the eyes of many this appointment set the seal on his anointing as Toscanini’s successor for he had come widely to be regarded as such. In many ways the comparison with Toscanini can only be taken so far but there are some similarities in their Beethoven styles. If you haven’t heard Cantelli in Beethoven but you enjoy Toscanini’s way with the composer I’m sure you’ll warm to Cantelli. 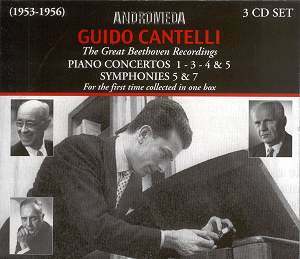 But even those who dislike Toscanini’s approach to Beethoven will find much of interest in Cantelli’s interpretations for he is far from being Toscanini Mark II and this set valuably collects together his significant Beethoven interpretations – so far as I’m aware there weren’t many other Beethoven pieces in his repertoire by the time he died. Backhaus opens the Fourth concerto a touch prosaically for my taste, the piano chords too staccato, but Cantelli unfolds the subsequent orchestral passage superbly When Backhaus rejoins the proceedings he plays with style and no little energy. The strings’ contribution to the slow movement is very fine. Cantelli gets them to play with real weight and presence initially, tapering off as the movement progresses. Backhaus plays serenely. The finale has abundant energy. The reading of the Fifth Symphony has great drive and power. The music suits a conductor of Cantelli’s vitality perfectly, of course and the first movement is strong, direct and very dynamic. He’s quite broad in the slow movement, though the music never lacks purpose or momentum. The transition from third movement to finale has a tremendous sense of pent-up energy and that’s then released in a blazing reading of the finale itself. This is a hugely exciting reading of the Fifth, which sends the New York audience into raptures. The Seventh is the only studio recording in the set. As such it enables the performers to avoid the occasional slip that comes with live performances. However, there’s no lack of spontaneity or conviction in the reading and the Philharmonia give the famously exacting maestro playing that’s out of the top drawer. In the first movement the music of the main allegro dances superbly, really justifying Tovey’s celebrated view of this symphony. The scherzo fairly zips along and the finale is all bustle and brio. With the exception of the Seventh Symphony, we are hearing the artists in recordings for which the sources are air checks that are over fifty years old. The sound is not at all bad but it is a bit bright and aggressive at times and the piano sound in all the concertos can be rather clangy. In the only recording where I was able to make a comparison, the First Concerto, I find the Music & Arts transfer is warmer and has a fuller bass response. But these Andromeda transfers are generally satisfactory. The documentation accompanying these discs is rudimentary in the extreme; only a track listing is provided, which I don’t believe to be wholly accurate. However, the main thing is that this set gathers together at an affordable price some bracing and stimulating performances by a musician who, had he lived, would surely have been one of the greatest conductors of the second half of the last century. All collectors who share my admiration for this exciting and great Italian maestro will surely want to have these performances if they don’t already possess them. I havent read the book to which Mr Jones refers but it seems from his note that either Howard Shanet or Cantellis biographer, Laurence Lewis, has made an error in identifying the soloist in this concerto performance. Without knowing the original sources that each has used its impossible to be sure which author is right and which one is wrong. What this factual discrepancy does show, however, is how easy it is to misattribute historical recordings. Labels issuing such recordings do need to take care so that collectors are not misled inadvertently. Its unfortunate that the pianist cant be identified with total certainty but its still a fine performance that we hear. Im most grateful to Don Jones for this additional information.